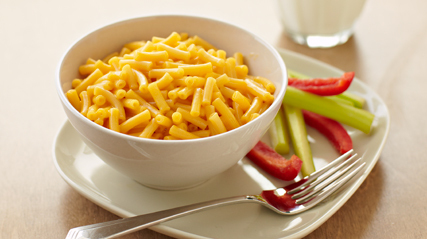 Let kids lend a hand with mac and cheese for a slam-dunk suppertime. 1. BOIL water. Stir Macaroni into boiling water in medium saucepan; cook 7 to 8 min. or until macaroni is tender, stirring occasionally. 2. DRAIN macaroni; do not rinse. Return to pan. Add margarine; stir until melted. 3. ADD milk and Cheese Sauce Mix; mix well.